So it seems like every March I get an excuse to salute or write about one of the most successful bands (not just of the '80s) but all time. It's a real shame it takes an Irish holiday to get me to talk about them it seems, but at least I'm giving them their due once a year. The '80s was when their recording career began with the release of the Boy album on October 20, 1980. By the time they released their 6th album Rattle & Hum in 1988, their success in the US had skyrocketed to impromptu concerts in California and selling out Madison Square Garden in New York. Thanks to their accomplishments worldwide, U2 is widely known as the most successful recording act from Ireland. So let's explore some facts about the band that are maybe lesser known so when you raise your glass of green beer on St. Patty's Day, you can impress your friends. The Edge's real name is David Howell Evans. U2 has sold over 150 million total albums worldwide, on the same level as artists like Frank Sinatra, Genesis, Aerosmith, Billy Joel, and the Eagles. U2 has one 22 Grammy awards, more than any other band. A suitcase that had been stolen in 1981 was returned to Bono in 2004 which contained the original lyrics for U2's October album. 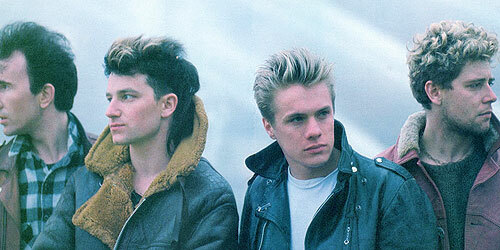 Former names of the band include "The Larry Mullen Band," "Feedback," and "The Hype." Bono's real name is Paul David Hewson. The Edge & Bono wrote the song "Goldeneye," performed by Tina Tuner for the James Bond film. The Edge & Bono also wrote music & lyrics for the Broadway musical Spider-Man: Turn Off The Dark. The Edge created the theme song for season 1 & 2 of the animated TV series The Batman. On Saint Patrick's Day in 1978, U2 won a talent show in Limerick, Ireland. In 1985, Rolling Stone magazine already had proclaimed U2 as the "Band of the 80s." The Joshua Tree album photographs were taken along California state route 190. Two provisional titles for the Joshua Tree album were "The Desert Songs" & "The Two Americas."